Nutrition for parrots can be quite a headache at times. So we have put together a list of safe and toxic items as well as a few recipe ideas for meals. Each morning and each evening, “Chop” is easy, quick, convenient and extremely nutritious for your parrots and parrotlets. It is as nutritious and healthy for them as the ingredients you choose to put in it. The wider the variety and the more nutritious the ingredients, the better it will be for your flock. There is no set recipe, just choose what’s in season, what your parrot likes, and bung it all together. 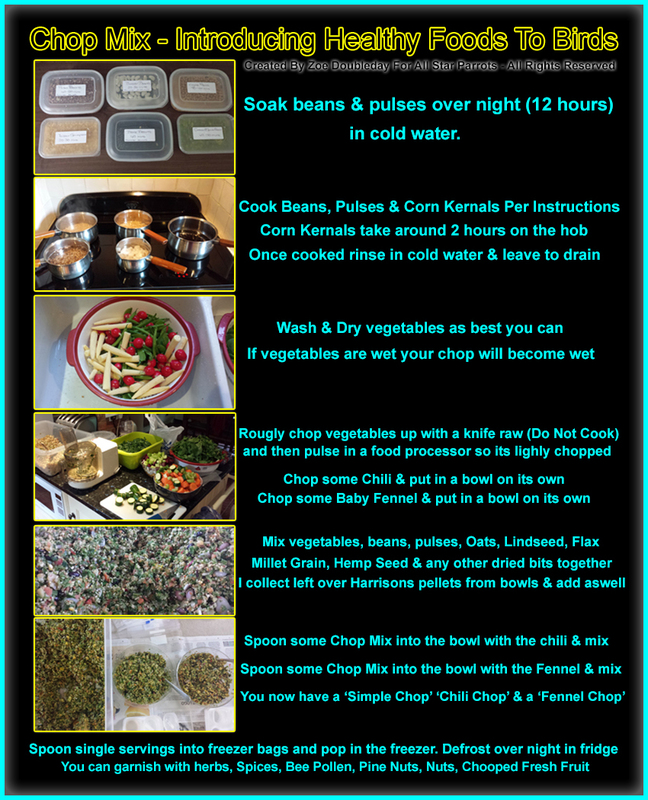 Chop can be kept in an air tight container in the fridge for 5 days, or you can freeze in meal sized portions. Just take a portion out the freezer the night before to defrost. Add fruit to your chop a couple of times a week, and garnish with safe herbs, spices, berries and seeds. Soaking or sprouting seeds and grains are an easy way to provide your parrot with fresh live food that is similar to what they would be eating in the wild. All birds, from finches to macaws benefit from and enjoy eating these. There are different sizes and types available for every size of bird. By soaking dormant seeds they germinate and are brought back to life again. Sprouts are like little vegetable plants packed with antioxidants, vitamins, minerals, essential amino acids and protein. Not only is this one of healthiest additions to your parrot’s diet, but it’s also one of the least expensive too?